African violets offer a challenge… They grow well and bloom almost endlessly under the conditions of the average home, but will not flourish so easily if you neglect it or lose interest. I’ve uncovered a 50 year old lost African Violet Growing Manual which helped 1,000’s of house plant lovers learn “How To” care for these beauties decades ago. 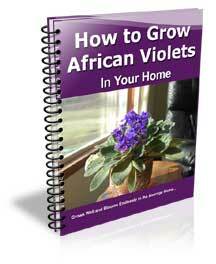 The manual has been updated… but the Tried and True Secrets of growing GREAT LOOKING African violets at home remain unchanged! How to Grow African Violets… In Your Home is an small Report covering the care information needed for anyone growing African violets or wanting to gain more information on one of America’s favorite indoor blooming plants. This report is an instant download the moment your credit is approved. It comes to you in PDF format, viewed with the free Adobe Acrobat Reader software. You have nothing to lose and everything to gain. If you don’t feel the African Violet Report is worthwhile, just email us and we will issue a refund. So if you’re serious about enjoying colorful African violets in your home, click the “Buy Now” button below. If you need to justify the expense, skip going to McDonald’s for dinner once this week and it’s paid for.